At least he got paid. Four copies of classic crap in one! Baseball and cataracts don’t mix. 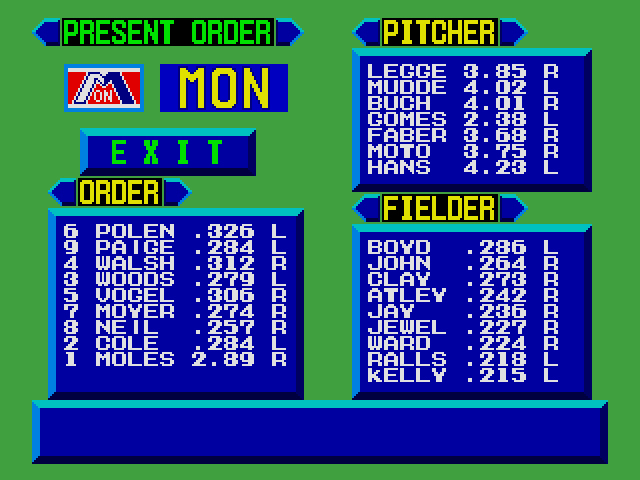 Super League invites you in with outstanding 16-bit player models, then kicks dirt in your face with the obtuse batting/pitching interface. When you first start a game, you’ll be placed in a standard behind-the-plate view, regardless of whether you’re batting or pitching. In this view, the batters are huge, nearly life-size. The detail – like the subtle beer bellies and the crinkle of their uniforms – is leagues beyond what we’ve seen on 8-bit systems. The smooth, fluid animation when the players bat and pitch is excellent, as well. Once someone gets a hit, however, the camera switches to a top-down view over the field and the players no longer look human. Their Greek physiques switch to stubby sprites that are more akin to 8-bit baseball. While this is an understandable transition – a top-down view makes sense when the ball is in motion over the outfield – the juxtaposition between the two viewpoints is jarring. Super League also has the worst batting/pitching interface I’ve ever experienced in any baseball game. Hitting a ball is almost impossible. Even when it looks like the ball and the bat should have connected, the ball will soar past your bat and into the catcher’s mitt. I’m convinced this is because of the perspective. 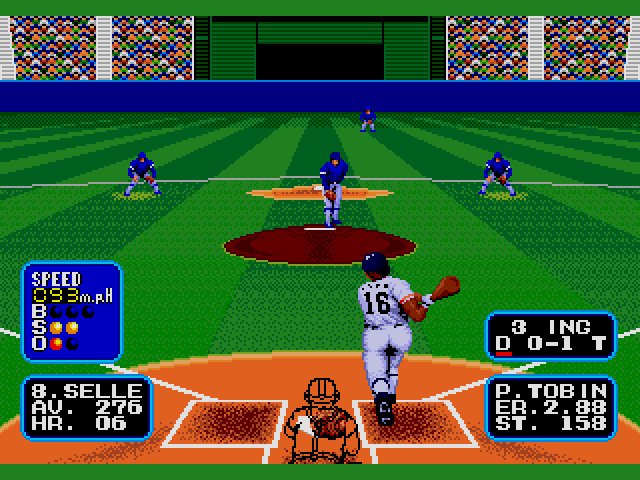 The pitcher is much closer than he appears to be, thanks to some visual trickery on Sega’s part. This means that his pitches take less time to reach you, even when the ball looks farther away. While this can occasionally work in your favor – I’ve gotten balls when I should have gotten strikes – the end result is often strikeouts. The only way to hit anything is to swing early and hope for the best. Even if the interface worked smoothly, you’d still have to wrestle with pitching and the outfield. You pitch either fast balls (straight) or curve balls, with little variation between the two types. The gigantic batter box dwarfs home plate, so it’s easy to pitch inside the box and give the computer a ball – unless you throw a straight fast ball. If you do throw a fast ball, expect the computer to at least hit it, if not get a home run. If a ball happens to get knocked into the outfield, expect a double or triple. Your outfielders take forever to get the ball and throw it back to the bases. Tommy Lasorda Baseball is Super League with the former Dodgers baseball coach serving as figurehead. Lasorda doesn’t do anything besides lend his smiling, unnerving visage to the game, but I’m sure he got paid well for his endorsement. Lasorda Baseball differs from Super League in play options only. Rather than playing a Central League or Japanese Baseball League tournament, you can play tournaments in either the U.S. or the World, have a two-player Exhibition game, or an Open Game. The European version of Super League is Tommy Lasorda Baseball sans Tommy Lasorda. 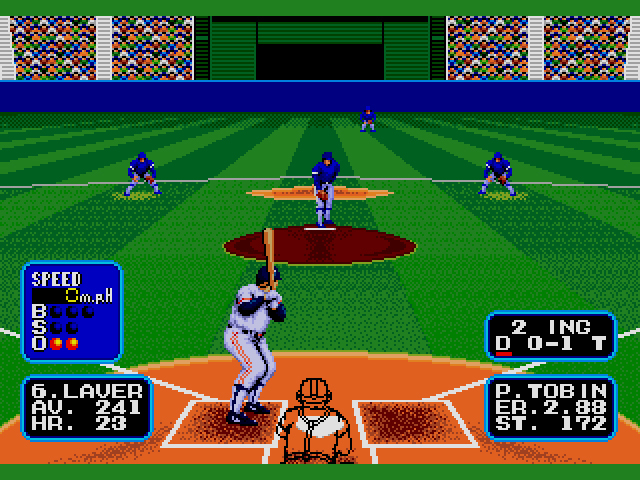 The additional features found in the latter make their way over to the European version, but because Lasorda’s contract was only good in America, the game was renamed back to Super League. If you think it will help your chances, re-arrange these fake players any way you like. Whether you call it Super League or Tommy Lasorda, this is a baseball game that may or may not require immense skill to play. Since I could never figure out how close/far away the pitches were, I racked up dozens of strikes. I played several different games with different fake teams and none of my players could get a hit beyond first base. Either I’m right crap at Super League – a possibility – or Sega needs to sit in the dugout and think about what they’ve done. Looking at pictures of LaSorda, he wasn’t the best looking dude and kind of an odd choice for an endorsement deal. I guess they thought kids tacked up pictures of baseball managers on their walls? Maybe they couldn’t get anyone else! I doubt many ball players were willing to shill for an (at the time) unknown game company. If you’re gonna sell out, sell out with Nintendo. Dude Dodgers had won the World Series. And Lasorda was a legend. Especially in the L.A. Area. He was like royalty down there. Everyone knew who Lasorda was. But true, other than his picture, he didn’t really have much to do with the game. Then again most sports names didn’t have much to do with the game back then. Wasn’t till John Madden where he had some invlolvment. Supposedly Joe Montana made some plays for his game but I don’t know how true that is. Plus, who could forget his Slim-fast commercials? One of my favorite baseball games ever. I categorically disagree with this review and think you are a bad person. No not really. But I Do love this game. I have had none of the problems you mentioned. I always thought this played well, and had a good variety of players with different skill levels. The good pitches can really move the ball around where you want. The bad ones have far less control. Plus they experience fatigue with overuse. Same with batters, some are better hitters than others, power hitters are. More likely to get you a home run. As far as hitting, I think it’s something you just adjust to till you get good at it. Plus at the time, graphically it was amazing. A few years ago I went back and played this again. Part of a contest by Sega-16.com to collectively beat every Genesis game on one year. I still enjoyed it greatly. If anything the music wears on you. 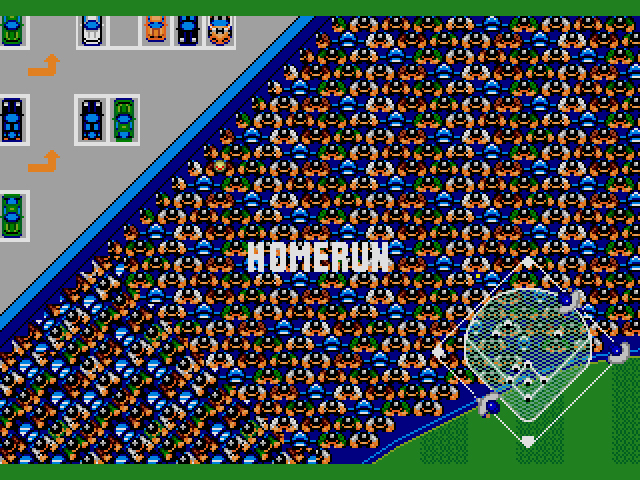 But other than that I consider this a fine baseball game still worth playing. I recorded my win in the World Series and the ending for prosperity on YouTube. Maybe the first time in video games I’d seen the use of digital photography. They have the programmers mugs. Sean, this video is awesome! Thanks for including it. Your not really leaving much room on the low end for real stinkers. Like Hardball. Ugh I hated that one. In all honestly I may have giving it an A- or Minumum B+. Which leaves such a large gulf between our scores that its obvious that this game maybe wasn’t for you? 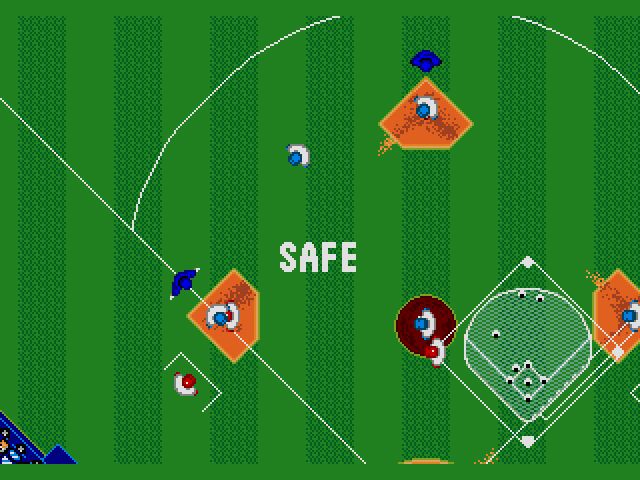 I think a good baseball game has to strike a balance between arcade twitch skill and a stat based approach. Like some games are so stat driven it kind of takes out the skill of playing. I think this game has a good balance.You need those twitch skills and have a lot of control over the action. But there are stat based considerations you have to make. Like batting order and what inning are you gonna pull your starting pitcher and switch to your ace relief. (I know they tried to model this on real teams stats because the Oakland team has the best relief pitcher in the game and is obviously based on Dennis Eckersly stats, as well as a monster power hitter modeled off Canseco.) if you are winning can you stretch you starter out an extra inning to save you backup pitchers? But the stat stuff is not so heavy to stop you from enjoying the game or using “Your” skills. Plus personally I lean more towards an arcade style approach anyway. But to play and win against the computer you have to make adjustments to win. It’s a good challenge. Like if you don’t manage your players the CPU will start belting out homers on your pitcher. In the video I posted, I won the World Series 4-3 in the 10th inning. It was a real fight. And they only give you a password to go back to the beggining of the World Series when you get there. So you can’t just reset after a lost game. You have to adjust game to game and keep trying to win or you have to start 0-0 at the beggining. So I think the balance is what appeals to me, as well as the relative simplicity of controls. Later 90’s era games added a lot of complexity to the controls that didn’t nessesarily appeal to me. Yeah, I’ll be honest, I’m nervous for later sports games. I’ve never really delved into any beyond 8-bit. Stats don’t appeal to me in the slightest, but I’ll have to learn more about them if I want to play the game beyond a certain point. 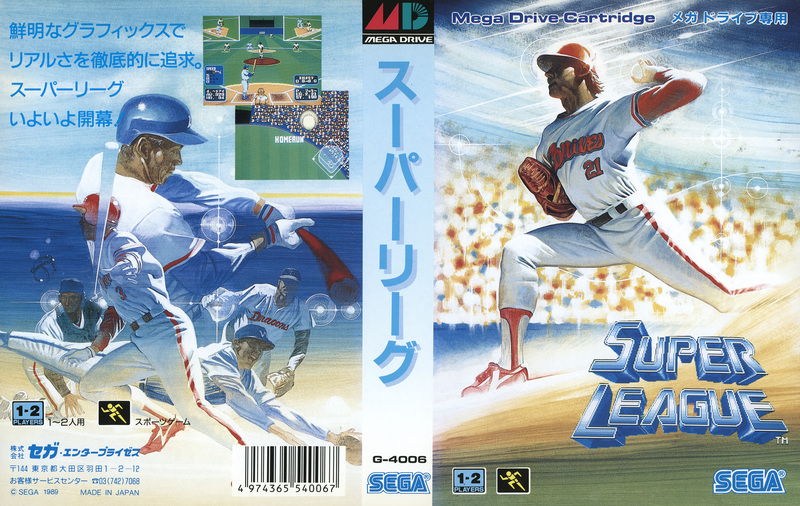 Also this game was based on Sega’s 1987 arcade game Super League. I’ve never seen it or played it. It looks like it plays somewhat more complex.mi notice the voice samples are the same though. My friend had this one back in the day and I too don’t remember it being that bad. 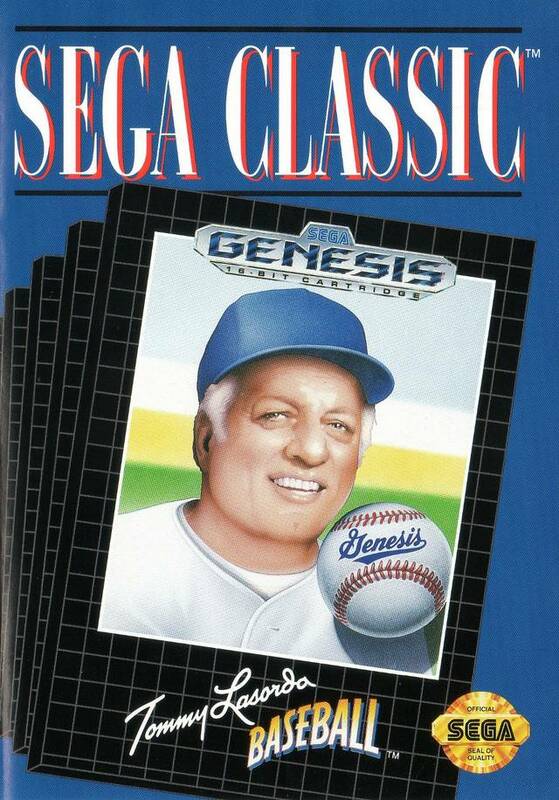 Especially for being the first baseball game on the Genesis. 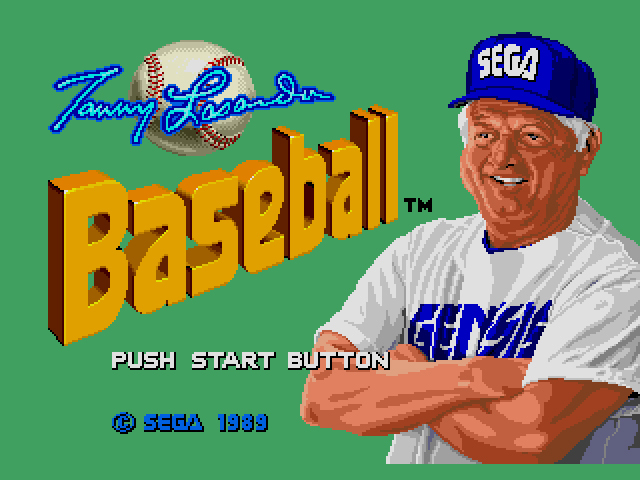 I had Tony Larussa Baseball and I liked that one better because it was more of a simulation game. The World Series Baseball series had the best games though.